Every now and then I come across portrait screens when installing TrilbyTV in schools. Nine times out of ten these are ‘end of contract’ screens installed by companies who don’t understand education. These screens and their contracts were far too expensive for schools, promising the world and delivering very little. For us at TrilbyTV, it’s all about utilising the hardware that remains, but not adding to the financial burden already placed on the school. This is simply achieved by plugging in a low-cost Android device to run TrilbyTV. That gets the screen back on, but another issue is creating suitable portrait screen content. We live in a world of widescreen where it’s easy to create 16:9 ratio landscape content. In essence, Portrait screens are simply widescreen TV’s on their side, so 9:16 rather than 16:9. Content for these screens needs to be the right size and orientation, which is 1080 pixels wide by 1920 pixels tall. Schools often aren’t set up to make great portrait content so here are a few ideas on how this can be achieved. As previous Apple Education Trainers, PicCollage was one of our go-to apps when delivering iPad training. It is super simple to use and allows teachers to think about new creative projects with their classes. Pic Collage creates simple portrait posters which are perfect for portrait digital signage. 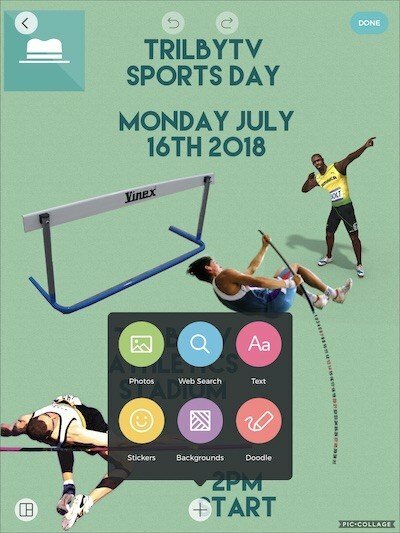 Below is a simple sports day poster I created by adding text and images from the web. The web search feature in PicCollage is great. Simply type in what you are looking for, such as ‘high jump’, and then choose from the results. Once your PicCollage is finished share to your camera roll and upload directly to a TrilbyTV slideshow and instantly to your portrait digital signage screen. Schools and their teachers are very used to creating presentations. Historically with Powerpoint, but Apple’s Keynote feels a little more polished and intuitive. I also love the availability of various searchable shapes you can now add to your slides. I needed a selection of musical instruments for my end of year Music Concert slide so I simply access the shapes dropdown and search for music. Various options appear such as trumpet, piano, cello and musical notes which I can click on to add. To make my slide look great on our portrait screen I’ve made it a custom size of width 1080 and height 1920 in document settings. When your slide is finished simply use the Keynote file menu to export as an image. Then upload directly to TrilbyTV as a single slide slideshow. Google Slides is not as feature rich as Keynote but its still easy to create a nice looking slide using simple text and the ‘Search the web’ feature when adding images is really useful. Google Slides are very easy to create and great for saving time and effort. 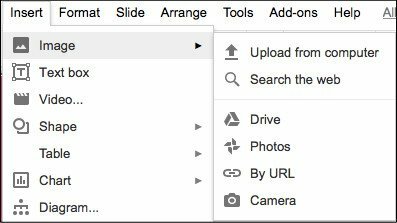 Once the embed code has been added to TrilbyTV all changes made live on the Google Slide change automatically on your digital signage. One of my favourite apps for creating polished and professional looking graphics. Populated with lots of templates its very easy to create an outcome in minutes if not a minute. It’s also really simple to remix these templates including making them Portrait. Once finished simply download them to your desktop and add to TrilbyTV. As I often say to our schools “It’s not rocket science” ! Keep it simple and use simple apps to create polished content for your digital signage. Or even better get your pupils to create polished content for your digital signage! Next post Next post: Embedding content – Power User Feature!